Quick and easy, only two ingredients in this Hot Chocolate Whipped Cream! Homemade whipped cream has to be one of the tastiest, easiest additions to any dessert. This holiday season, I find myself experimenting with all different flavors of whipped cream. I wanted to share this one with you since the season of hot chocolate is upon us and it is a twist on your normal chocolate whipped cream! There are two simple ingredients in this Hot Chocolate Whipped Cream. It only requires heavy whipping cream and powdered hot chocolate mix! I’ve played around with varying types of hot chocolate mix including Ghirardelli and a more traditional Swiss Miss packets. You’ll definitely want to use a quality hot chocolate mix since that is the primary taste in this whipped cream. Ever since I’ve first made my hot chocolate whipped cream, I’ve found various ways to incorporate it into my baked goods. 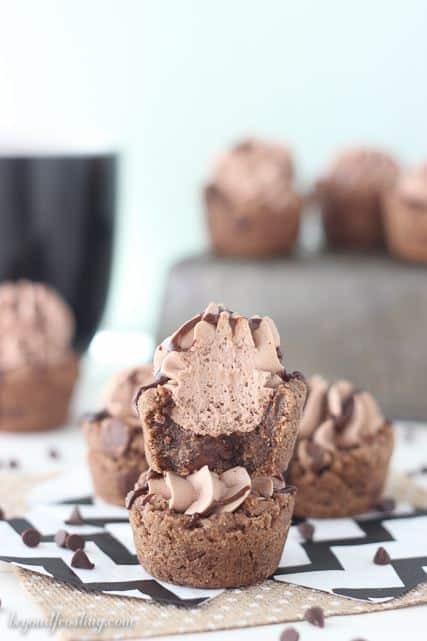 It makes a great topping for cakes and cupcakes and I even made a Hot Chocolate Cookie Cup. I’ve also played around with various versions of flavored hot chocolate including cake batter and cinnamon maple. 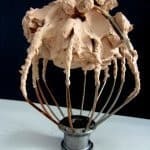 The hot chocolate whipped cream and cake batter version are more mousse-like in texture than a traditional whipped cream. Due to the amount of powdered ingredients involved, it becomes much thicker. The great thing about a hot chocolate whipped cream vs a regular chocolate whipped cream is that hot chocolate version tends to be smoother and more milkier. 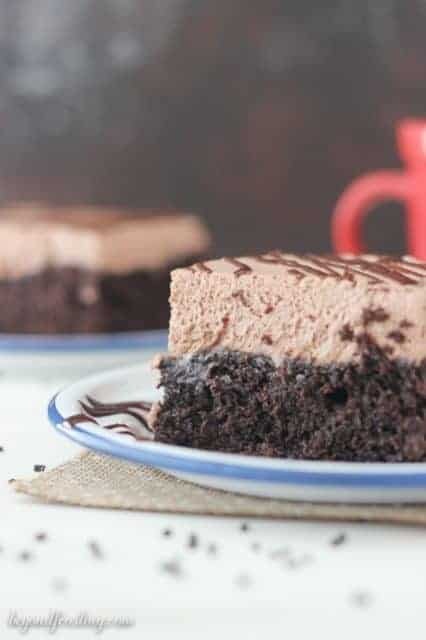 This is because cocoa powder is unsweetened and can be bitter if too much is used without something like vanilla extract or powdered sugar for sweetness. So you might be thinking to yourself, what are some recipe I could use this with besides the cookie cups I mentioned above? Well my two favorite ways are in my sinful triple chocolate poke cake (pictured above) and my peppermint hot chocolate poke cake. 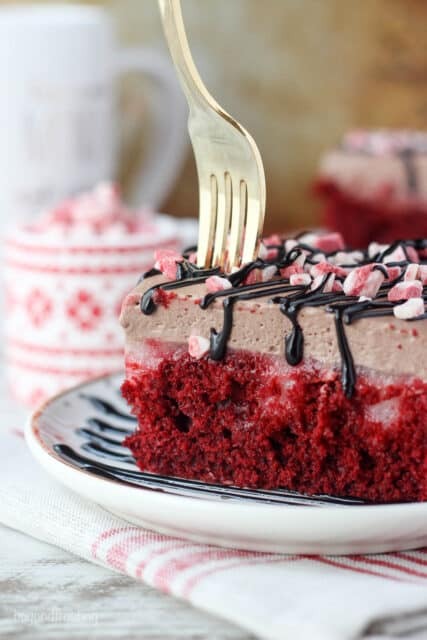 Although I also made a traditional hot chocolate poke cake, the peppermint version offs something extra special. While this whipped cream makes a great topping, it’s also really nice for piping cupcakes. I find I am most successful piping cupcakes when I have quality piping bags and my jumbo piping tips. Plus using a piping bag makes it easier to just squeeze some of this right into your mouth! Otherwise, just grab a spoon and dig right in! No one is judging over here. Place metal bowl and whisk in freezer for about 15 minutes so they are good and cold. Pour heavy whipping cream into mixing bowl and beat on high for 2 minutes. Add hot cocoa mix and continue to beat until stiff peaks form. Keep Refrigerated. Use a piping bag to frost cupcakes or cookies or spread over cooled cakes. Hi Katyy, I would start with maybe 1/4 teaspoon and then add 1/4 teaspoon at a time until you like the flavor. Peppermint can be a little over bearing so I think it’s best to ease your way in! Hi there, just would like to know how many cups will this produce after whipping or like how many 3oz cupcakes can it cover? I am now very eager to try this one, looks so yummmmyyyy! This recipe sounds amazing! 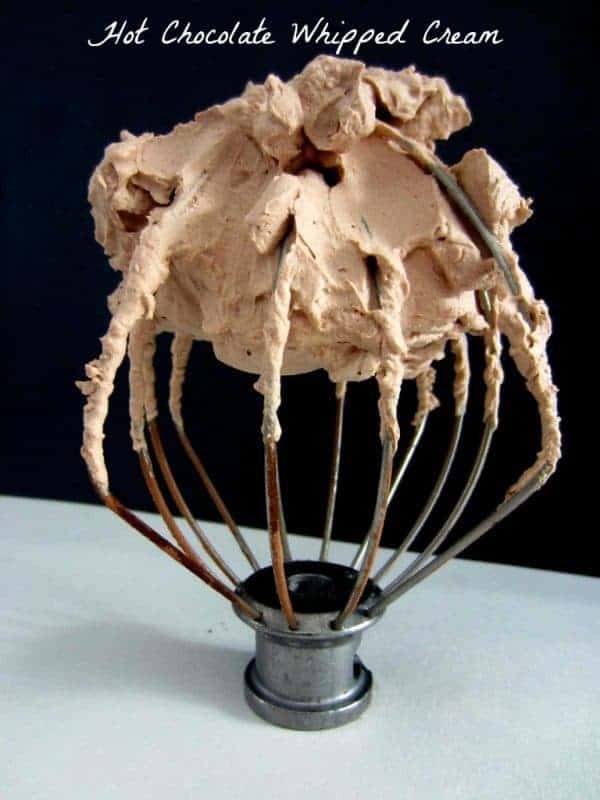 How much frosting will this yield? I really want to use it as a cupcake filling. Hi what do you mean by hot cocoa ? In australia hot cocoa is.milk and quick chocolate and you heat it up to.make hot chocolate? . Hi there! Do you have a dry cocoa mix that you mix with the milk? That is what a hot cocoa mix is. Hi Ely. Yes, you can use Cocoa powder. You will need to adjust the amount according to your desired taste buds, but you will not need as much cocoa powder as you would hot chocolate powder since the taste is much strong. 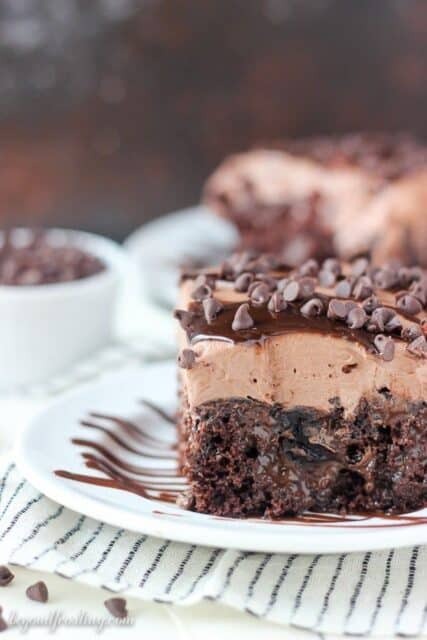 Offset the bitterness of your chocolate with vanilla extract.